So… I ordered some goodies from this website Tallygear! I got this Silicone Skin in PINK Flamingo and the Decal in SPLASH color. The total came to $22.90 pre tax and shipping. Not bad at all. The owner at Tallygear gave me a Spandex Dexcom G4 case for free since I was going to do a review on these accessories anyway. I chose it in black. the decal, super cute! I love it. The Dexcom itself is black, so the decal helps it stand out. It was easy to apply, and I got one bubble, but I was able to un-peel and then re-peel the decal. It goes really well with the Pink Flamingo case color as well. I LOVE the silicone case! 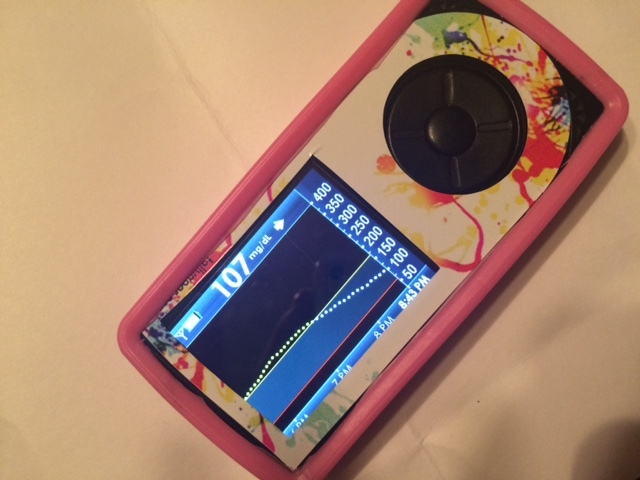 It is like a squishy phone case, and it is raised so if you drop your dexcom face down (NOOO!!!) it has like a cm of height. This prevents things like screen cracks and such and damage to the buttons or screen (we all know the Dexcom ain’t cheap!). The black spandex case is also quite nice. I had to take the silicone case off as you can see. 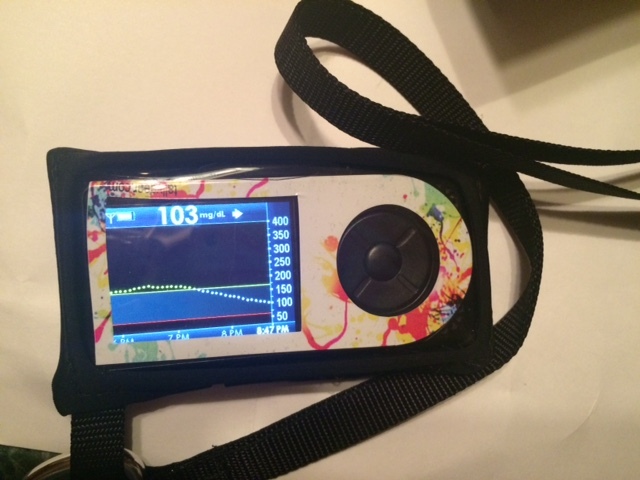 You have to glide the dexcom in through the back, which I love because there is just about 0 chance of it falling out. It comes with a belt loop on the back as well made of spandex so you can easily attach it to your pants if wearing a belt. There is also a metal hook that is pretty sturdy, so you can attach your dexcom to a belt loop, or I did it to my purse. If all else fails…it comes with a long strap. You can wear it around your neck under clothing (or above) or wherever you please. You can use the buttons through the plastic covering of the case, which prevents scratches, and it is snug fitting. Overall, very pleased with all 3 of these. The Dexcom comes with a case when you order it, but I did not like it. It was rather bulky and not “cute”. 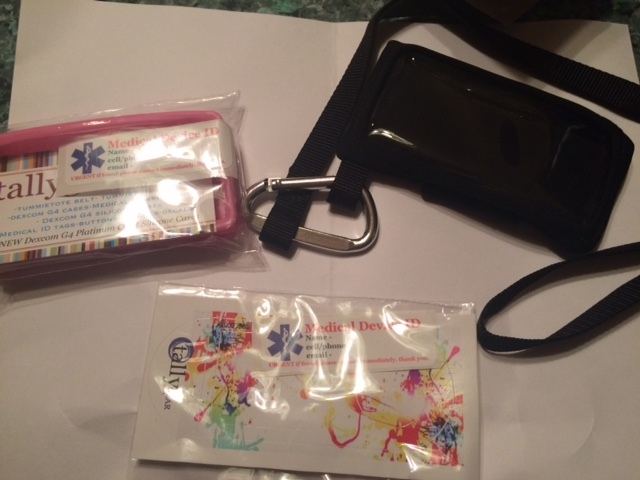 These accessories help make the disease a little more fun…bright colors and cute decals. They come in plenty of colors (red, orange…etc.) and have many decals on their site. If I could provide feedback about the website it is a *tad* confusing, but scroll down to the bottom and it will have suggestions for you. Please check out Tallygear, they have some great stuff! They also come with Medical labels, which I placed on the back of my Dexcom. You can see it in the picture above. I received some of these items for free. This is an unbiased review.